2017 Nissan Sentra SR Turbo! 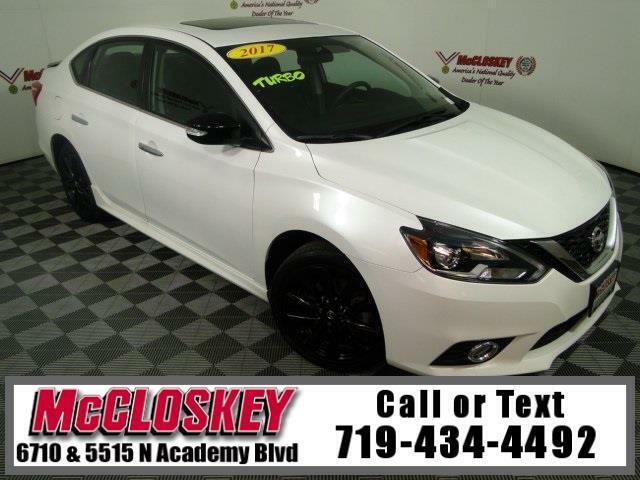 Lowest miles 2017 Nissan Sentra SR Turbo in 350 miles! Offering Power Moon Roof, Turbo Charged Engine, Keyless Entry and Ignition, XM Radio, Heated Seats, and Much More! The SR gets 17-inch alloy wheels, rear disc brakes, a sport body kit including a rear spoiler, LED headlights (low beams), foglights, heated mirrors, upgraded cloth upholstery and heated front seats. The SR Turbo adds a more powerful engine, a sport-tuned suspension, recalibrated steering, upgraded front brakes and a sunroof. The new SR Turbo gets a turbocharged 1.6-liter four-cylinder, which puts out 188 hp and 177 lb-ft.